The Resources library enables the user to search for publications produced by C-Change, including our country programs. For additional resources, tools, and communication materials produced by the C-Change project, visit C-Hub. To search, use the scrollable list boxes (country, topic, type) and the fill-in box (keyword) on the left to initiate your search. To make more than one selection in the search areas, hold down the Ctrl key and select with the mouse. Similarly, to deselect, hold down the Ctrl key. The Reset button allows you to clear the fields and initiate a new search. 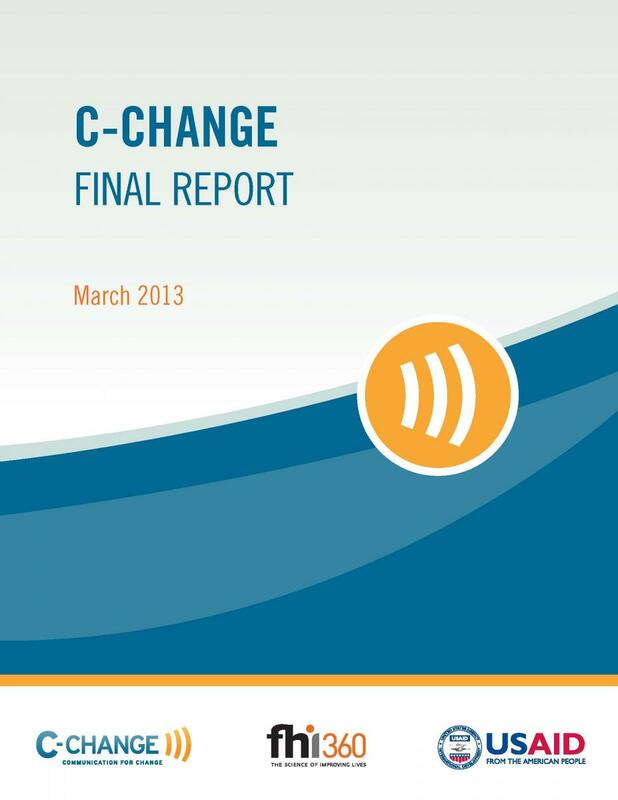 The C-Change DRC Final Report summarizes the three-year Associate Award implemented in DR Congo from August 2012 to July 2015 to strengthen institutions at the central and provincial levels and to provide technical assistance to ensure quality and to build managerial and SBCC skills with the government, NGOs, and civil society. 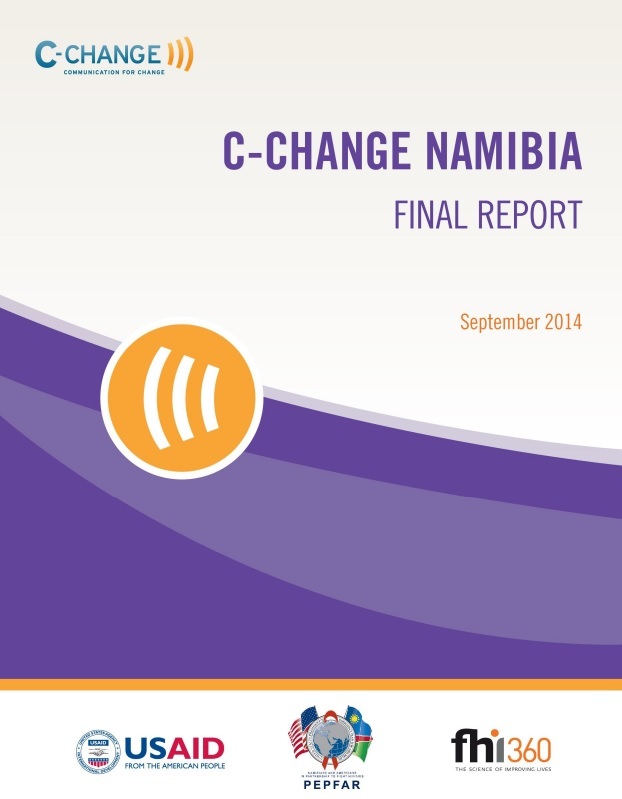 The C-Change Namibia Final Report summarizes the three-year Associate Award implemented in Namibia from October 2012 to September 2014. This C-Change report highlights findings from a study that assessed the ORS and zinc prescription behavior of general practitioners (GPs) and midwives to treat childhood diarrhea following an intensive pharmaceutical marketing intervention in Indonesia. The intervention was intended to extend the cascade of influence to front-line health care providers that treat childhood diarrhea at the community level; it also aimed to convince drug manufacturers of the viability of targeting these groups as potential prescribers of zinc. The analysis focused on GPs’ prescription of ORS and zinc and exposure to information on zinc before and after the intervention. The findings suggest that the pharmaceutical marketing intervention maintained, increased, and/or facilitated prescription of ORS and zinc among GPs. This case study focuses on the collaborative relationship between the Southern African AIDS Trust (SAT) and C-Change from 2009 to 2012 to support the regional network's ability to contribute to the application and transfer of SBCC and build upon existing relationships, support structures, and technical skills. The overall goal of the collaboration was for trained SAT network partners to cascade SBCC to other organizations that SAT supports. This case study highlights the relationship building between SAT and C-Change as well as the various capacity strengthening activities, results, and lessons learned. This case study focuses on C-Change's approach to establish and support university-based programs and developing Centers of Excellence (COEs) to achieve long-term and sustainable programs. It documents C-Change's experience with the development of and continued support to COEs in South Africa, Albania, Guatemala, and Nigeria. This case study focuses on C-Change's experience working with regional networks to strengthen the capacity of their country members. C-Change worked in partnership with three regional networks, the Southern African AIDS Trust (SAT), the African Broadcast Media Partnership (ABMP), and the African Communication Network (AfriComNet). The case study documents C-Change's experience collaborating with regional networks and provides overarching lessons learned and recommendations for future collaborations with networks. 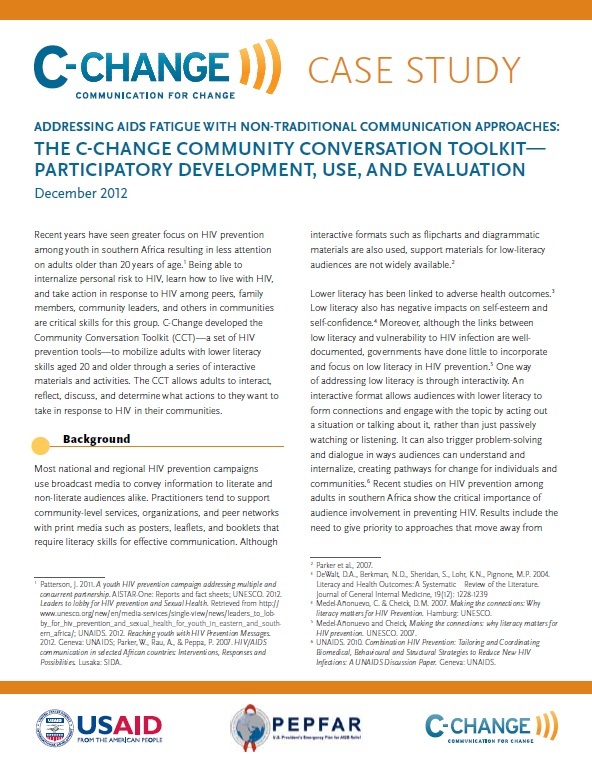 This case study focuses on the development, adaptation, use, and evaluation of the C-Change Community Conversation Toolkit (CCT)—a set of HIV prevention tools—to mobilize adults with lower literacy skills aged 20 and older through a series of interactive materials and activities. The CCT has been adapted in seven countries and is available in 10 different languages. For detailed information on the evaluation see: http://www.c-changeprogram.org/resources/c-change-community-conversation-toolkit-evaluation-report. C-Change collaborated with T-MARC, a social marketing firm in Tanzania, to investigate the potential of radio messages with gender-transformative content to increase the sales of contraceptives from community based distributors in two peri-urban areas of Tanzania. C-Change also provided special training on gender to community based distributors as part of the operations research study. 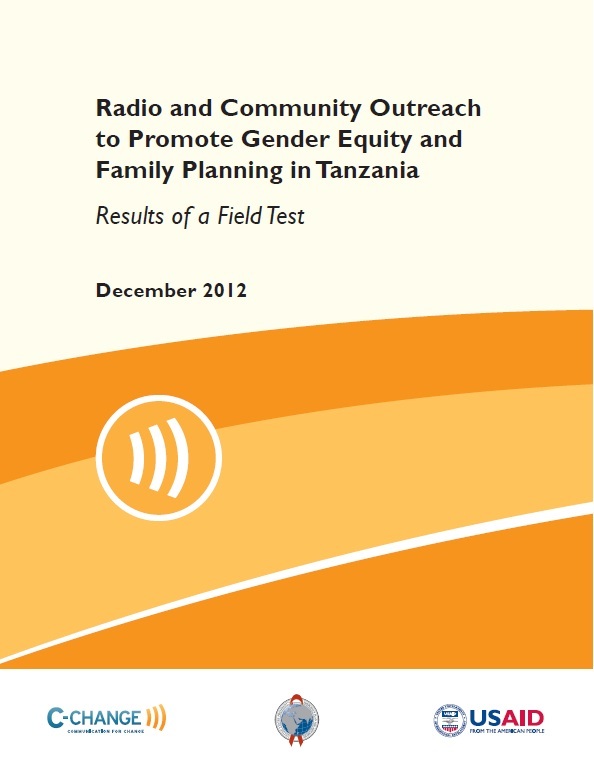 The results are outlined in the report Radio and Community Outreach to Promote Gender Equity and Family Planning in Tanzania. 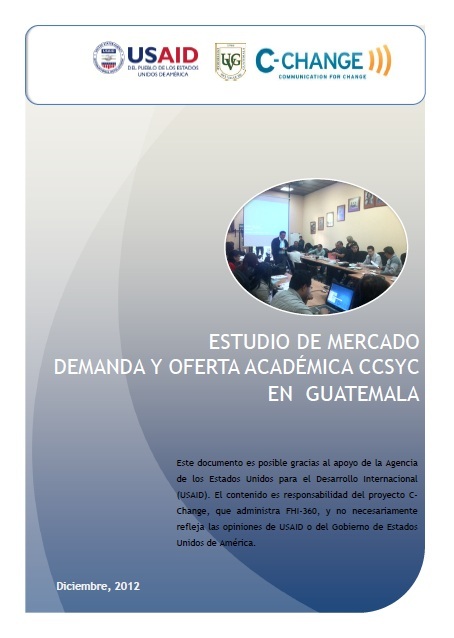 From October to December 2012, C-Change conducted a market study to measure the feasibility for multi-level academic offerings (from short online courses to a masters degree in communication) at the Universidad de Valle, Guatemala (C-Change's Center of Excellence) with a particular focus in the Western Highlands. The study analyzed the compatibility of potential participant needs with available/current and potential/future academic offerings; segmenting audiences for geographic, demographic and psychographic factors, levels of education and cultural appropriateness. The market study also include a detailed cost analysis and recommendations based on study findings. Based off results of this market study, UVG will be offering semi-face-to-face courses in 2013; a specialization in SBCC in 2014 and a masters degree in SBCC in 2015. Note that this study is in Spanish.